November 2013: Decided to take a Himalayan Journey with two of my mountaineering friends Ms.Christi Massi and Scott Masengill,resident of Seattle,USA..both avid mountaineers,especially Christi very fit and always raring to go a mile further if it is in the mountains,with me as their Guide.The trek route Christi Choose was the Singelila Ridge in Sikkim Himalayas,an ardous 12 day trek where we would be trekking on the very spine of the SingalilaRidge,atleast till Dzongri.We started off with the Trip to Gangtok where we had to procure the Trekking permit and a visit to the Rumtek monastery.The next day,a days drive brought us to Pelling,a small town in west Sikkim,just below Pemayangtse monastery.We acclimitized ourselves by taking a walking tour of Pemayangtse Monastery,considered one of the Holiest monasteries in Sikkim and Rabdantse Palace Ruins the next day. Day 1 : Rimbi to Nayapatal : The Trek started with an hours drive to Upper Rimbi,a small hamlet with a few houses where our support team was waiting for us to join them. The team comprised of Nandu Gurung our Sherpa,responsible for the Tents,Phukchung our Pony man,Maney the Cook with Ruben,Dhan Bahadur and Tshering as the Kitchen helpers. The Trek started with a slight uphill trek on a narrow trekking trail for about 2Km till the village of sangkhola, where we had to cross the river on a rickety bamboo bridge(as the old one had been washed away in a flash flood).We crossed the bridge one at a time and then it was uphill 3Km trek till we reached the village of Chongri at an altitude of about 2600m,here we stopped for lunch.Maney our cook with his helpers Ruben and Dhan Bahadur prepared some hot soup and macaroni for lunch with hot Darjeeling black tea for desert.After lunch it was an easy downhill trail till we reached the river bed and where we had to register with the security forces emerging out of no-where in the middle of the forest.Then it was uphill through winding trails in the deep Magnolia and Rhododendron forest till we reached another defence post where we had to show our documents again.After a good Chat with the soldiers we took an uphill path through the forest for about 45minutes and there we reached Nayapatal our Camp site for day on a high ridge overlooking the camps below us. 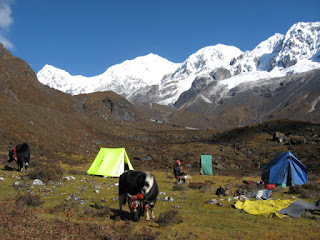 Day 2 : Nayapatal to Yambong : Today we will be going into higher altitude.The Trek was through Pine and Maple forest till we reached Yambong our Camp site. Christi was really fast on the trail and I really did have hard time keeping up with her.Reached the camp site by noon.This is where we enter the alpine vegetation in the Sikkim Himalayas,the snow line where no forest exists and only cryptomeria bushes can be seen around.This is Yak country. Day 3 : Yambong to Gomathang : The Day started at 6am with Ruben providing us the wake up tea that was so hot & strong,a horse shoe would float on it.The going was slow due to the higher altitude but we did make it to Dafey Bhir Pass by 12pm at an altitude of 4635m.The first Sight of Makalu did us good just as were approaching the Pass.Then all our tiredness was gone as the sight of the Himalayan Mountains loomed in front of us.The sight was mesmerizing,with Everest,Makalu and Lhotse to adorn the horizon on the left and Kanchenjunga and her siblings on the right.With the four 8000m peaks & with the two highest peaks in the world in the horizon it was a sight to hold on to for a life time.Lunch was forgotten in the meele of the photo session that took place high in the DafeyBhir Pass.After a brief lunch we headed down hill through knee deep Snow till Gomathang our halt for the Night. Day 4 : Gomathang to Pangdin : The Trekking Trail to Pangdin our next Camp site gradually climbed through thick silver fur and Rhododendron forest with some glimpses of the mountain range from time to time.The fourth days trek was the longest so far and we reached the Camp site in the late afternoon.All of us were staring at the high Himalayas in front of us.The most prominent was Mt.Kabru,Rathong and the Frey’s Peak.The summit of Kanchenjunga is not visible from this point as it lies behind Mt.Kabru.Christi as always never tires and she took a walk up to the highest point and clicked some real good Panaroma shots of the everest andthe Kanchenjunga Range(which she later gave it to me too).Maney as usual always kept our stomachs full by churning out some delicious food,be it breakfast or a fast lunch on the way or a relaxed dinner in the evening and we always welcomed the hot stimulating Darjeeling black tea any time of the day. Day 5 : Pangdin to Ghattey Khola : After the boys had packed up and loaded the ponies,we started the Trek on a light foot as the terrain was on level ground and with the mountain views in front of us all the tiredness was gone.We made good time as it was a pleasant trek through valleys with the Blue sheep grazing on the high hills above us until we reached our campsite at Ghattey Khola by early noon,just below Himalayan Mountaineering Base Camp at the foot of Mt.Kabru. Day 6 : Ghattey Khola to Dzongri : So far the shortest day on our Trek.The Trek to Dzongri was a mere 7Km uphill trek till Dzongrilla Pass at an altitude of about 4200m.From here it is all the way down hill till our camp site at Dzongri.We made it by noon.From Dzongri the Summitof Kanchenjunga,Mt.Kabru,Mt.Pandim seems very close.The Camp site from here onwards till Lamunee is dominated by these mountains and wherever one turns it is always against the backdrop of these snow clad Mountains.The Trek to DzongriTop(4030m) for the sunset views was overwhelming with the 180 degrees view of the mountain range infront of you,which seems to touch the sky.The cold wind brought us back to our tents and ofcourse as always some hot black tea to stir you up. in our cameras. Rest of the day ,we just lazed around the campsite trying to rejuvenate ourselves.Christi and Scott were busy with their Kindle while the boys washed their dirty linens. Day 8 : Dzongri to Lamunee : The Trek to Lamunee was fairly easy through the alpine meadows of Dzongri with the tantalizing views of Mt.Pandim (6691m),considered one of the holiest Peaks in the Sikkim HimalayasMt.Thinchenkhang,Mt.Narsing and Mt.Kanchenjunga giving us company until 2Km.Then a sharp 2Km drop to the river bed at Kookrochoong then a gentle uphill trek for 3Km brought us to Thansing valley.The Thansing valley at an altitude of 3986m is the Base Camp for mountaineers trying to summit Mt.Thinchenkhang & Mt.Jopuno.Maney and his helpers were ready with hot lunch and after a brief halt of one hour we started for our next camping destination,Lamunee 2Km. away below Samiti Lake at an altitude of 4164m. meal.After lunch a slow and lazy downhill trek to Kookrochoong where we camped by the river side for the night.A well deserved rest after a hard days Trek(24Km approx). Day 10 : Kookrochoong to Tchoka.The Trek to Tchoka from Kookrochoong is 15 Km and most of it is through Maple and pine forest with the views of the Mountain range appearing at times until we reach phedang (1okm) a small clearing in the middle of the Rhodendron forest our lunch spot.Then it was 5Km downhill trek on undulating mountain trail till Tchoka,a small Tibetan settlement with a few tea houses ,a monastery and a couple of trekkers huts. Day 11 : Tchoka to Yuksom : The Trek to Yuksom was a long 13Km journey through virgin forest of the KanchenjungaNational Park and was uneventful,in the sense that no mountain scenery was visible.It was just trudging along in the forest until we reached Yuksom & civilization and ofcourse the end of our wonderful Singalila Ridge Trek inSikkim. This Concluded our Sikkim Singalila Ridge Trek to Goechala Pass.